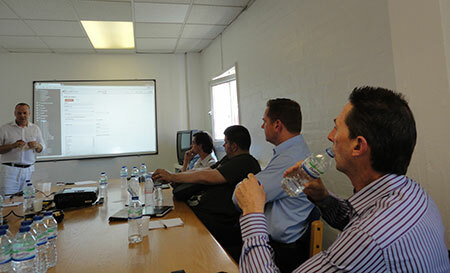 On July 17th resellers from around the country attended a Software Presentation and Training event at the AlfaRichi Offices in Birmingham. The event gave resellers the opportunity to see how easy it is to get AlfaRichi software installed and running on an Android device, and how quickly product lists, pricing structures and till layouts can be created so end customers can be online and selling within a matter of hours. A typical hardware setup was demonstrated and resellers were able to, with just minutes of training, link an Android tablet running AlfaPoint to a cash draw and receipt printer and start making sales. Resellers were impressed at how the easy to use and intuitive front-end of the software was supported by a robust suite of sales reports on the cloud-based back office. Resellers were also shown the full features of AlfaRichi software, including customer loyalty, wholesale ordering, stock control and e-commerce options. By the end of the day the resellers in attendance had all the tools and knowledge they need to demonstrate to potential customers why AlfaRichi software is a complete and future-proof EPOS system which could benefit any number of business types, from a single shop to multinational chains and franchises. AlfaRichi software and associated hardware is sold and supported by a network of approved resellers. Request information about becoming a reseller.